Since the introduction of ultrasound in cardiology in the mid fifties, echocar- diography has continued to grow and has finally become, in particular after the introduction of Doppler modalities, the working horse of the cardiologist. Although many books have been written on this subject Dr. Hamer's book is a very valuable contribution, as it provides, in particular information for practicing clinicians and technicians. Clearly written and nicely illustrated, this book is a must for those interested in this field. C.A. Visser Professor of Echocardiology Preface Trans-thoracic echocardiography is a patient friendly technique without pain or discomfort. It is harmless and the patient can relax during the examination. With these advantages in mind there is hardly any technique in cardiology that can provide so much valuable information about the function of the heart. 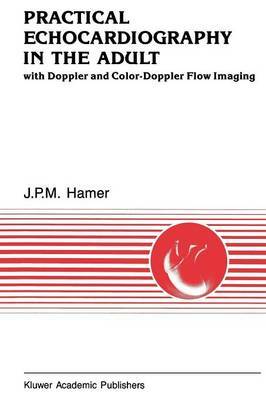 If Doppler and color Doppler, also painless techniques, are added to echo- cardiography additional information about blood flow velocities, insufficiency and stenosis of valves, detection of shunts etc. is obtainable. Less patient friendly but - if selectively used - very informative, is trans- esophageal (color Doppler) echocardiography.